GIUNTINI PROJECT, led by an Italian guitar wizard Aldo Giuntini, will release the album GIUNTINI PROJECT IV through Escape Music on May 24th. Also the Japan version added a bonus track "You Love Killing", has been set to release on May 22nd. This project launched in 1988 and the fisrt self-titled album was released in 1993. 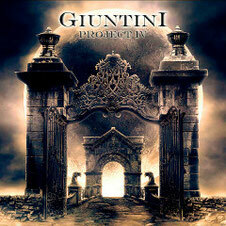 The sound of Giuntini's work is a combination of the warmth and the power of BLACK SABBATH, RAINBOW and DIO with energetic sound of LOUDNESS, the Japanese metal hero, while Giuntini's guitar playing is mainly influenced by Akira Takasaki, Vivian Campbell, Edward Van Halen, Jake E. Lee, John Norum and of course Yngwie Malmsteen. Handling all vocals once again on this album is none other than Giuntini's favourite voice Tony Martin (ex BLACK SABBATH), with the help of Ezio Secomandi (on drums), Dario Patti (on keyboards) and Fulvio Gaslini (on bass). Produced by Dario Mollo (Mollo/Martin), promises to be like a breath of fresh air and will sure please the long time fans as well as the new ones.